Merry Christmas! If you missed the Special, follow that link! EXPONA: (thinks) Lissa's never any help. EXPONA: Hey, Cosine, is that you? EXPONA: Wow, it is! Where is Sine? EXPONA: Oh, Sine, there you are. Para spun at the unexpected sound behind her. It was her voice - yet not her voice. "Oh, it's you," she sighed, raising a hand to her chest in relief. 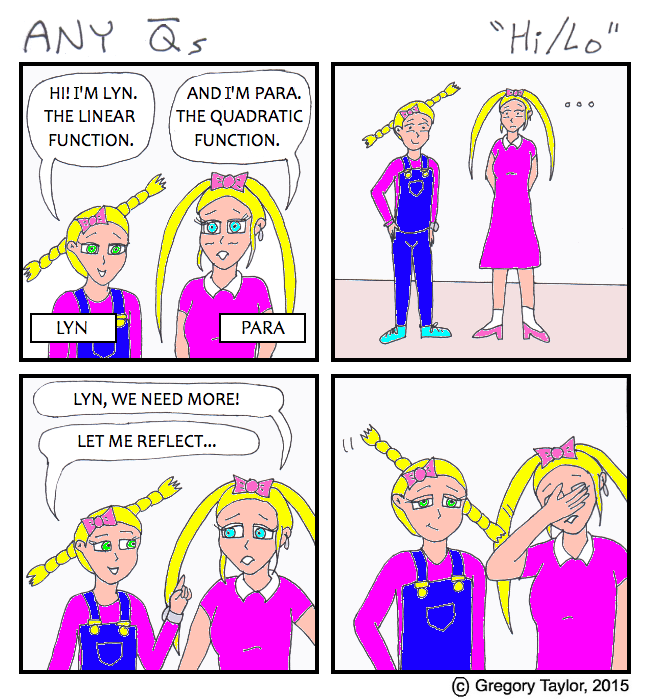 ParaB, the parabola girl's conic counterpart, raised her hand in a slight wave. "Sorry, didn't mean to startle you. But being incorporeal now, I tend to sneak up on people whether I want to or not." "It's fine." Para returned her gaze towards the dark sky. "It doesn't feel like it's been a year since our last Christmas recording." "I'm not sure it has been," ParaB pointed out. "Not for us, anyway. Ever since we messed with that wormhole, 'space is warped and time is bendable'." "Right." 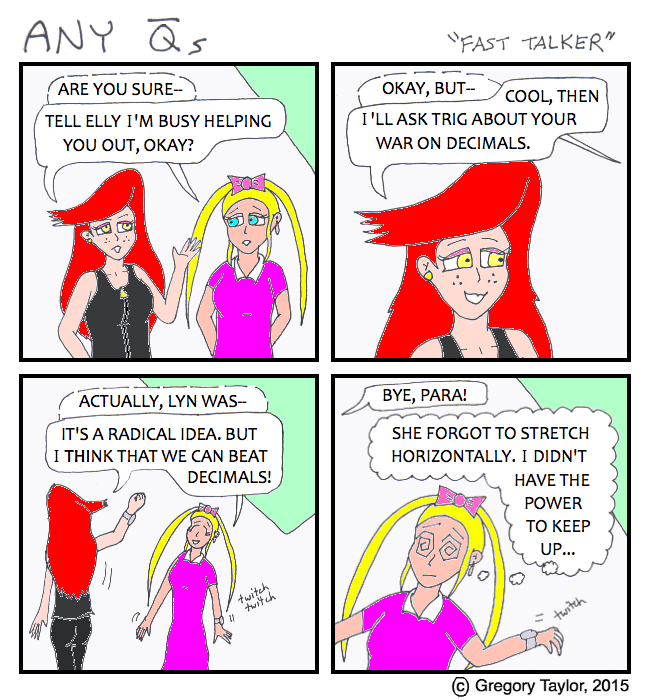 The blonde parabola rubbed her arms as a chill ran through her. "In other words, ever since we were told our very existence was inconsequential." "Yeah. But that didn't stop us last year." Para bit down on her lip. "79 views, ParaB. Total, over the last year, for BOTH our 'Polar Plot' videos, mine and Expona's. I dunno. Maybe those other personifications were right. Our time has passed. If it ever even came." "Or maybe we need a better agent," ParaB countered. "We can't give up! The new personifications aren't even doing music." "Sure, because it's not sensible mathematics pedagogy!" "I don't care. I wrote a holiday song anyway." ParaB placed her hands on her hips. "What's more, it uses classical music, and statistics. So there." Para turned to stare at her counterpart. "It... what?" ParaB smiled. 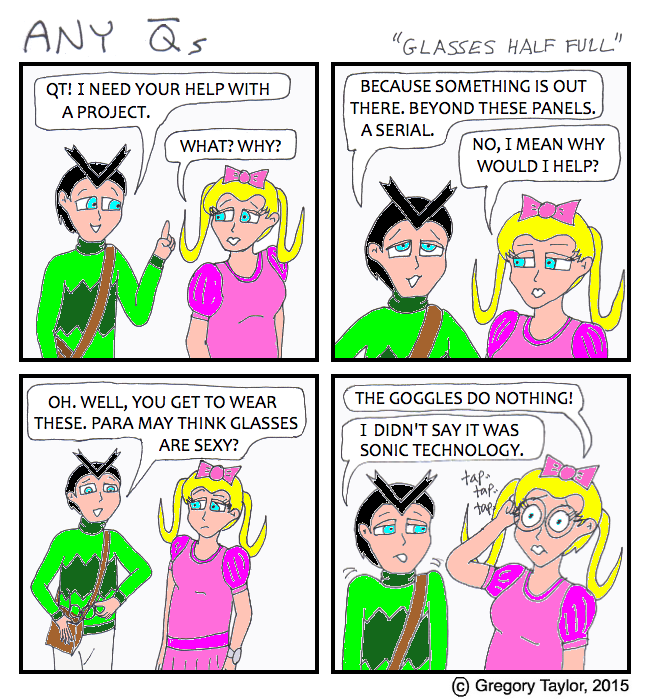 "I had some help from Sigma, QT's magical girl interface. Though I guess Sigma's also Hyper's magical guide, depending who you talk to." "Let's round up the gang then. The bar, in an hour." Para nodded. "Okay! Though... your song, it... it DOES follow all the established rules, right?" "Oh yeah," ParaB said, winking. "It's canonical." 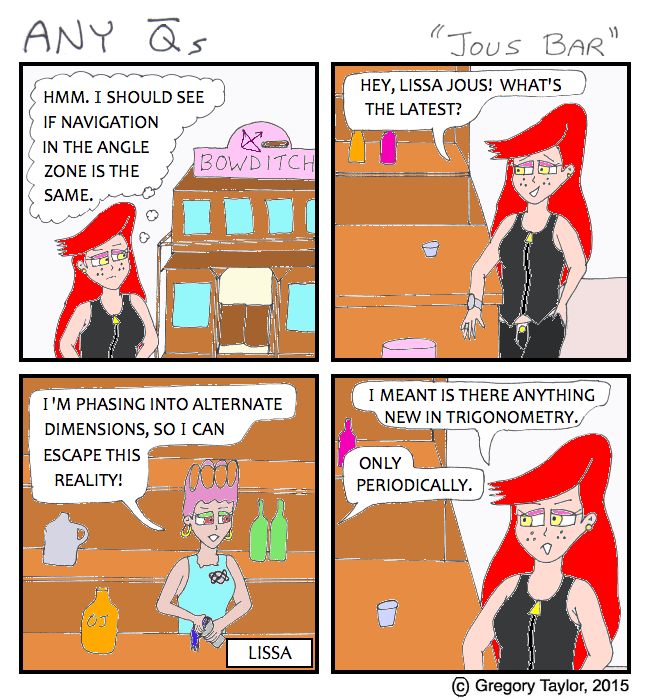 With thanks to John Golden for the character of Lissa Jous. EXPONA: (thinks) Hmm. I should see if navigation in the Angle Zone is the same. EXPONA: Hey, Lissa Jous! What's the latest? LISSA: I'm phasing into alternate dimensions, so I can escape this reality! 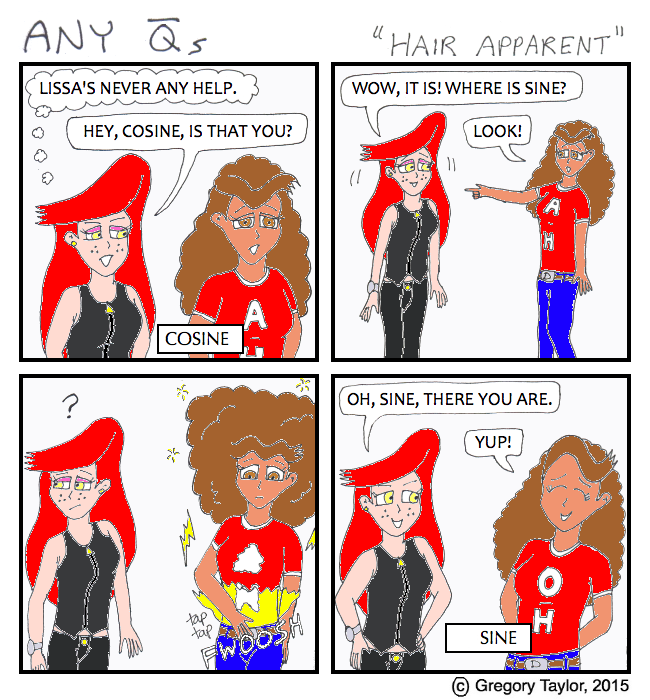 EXPONA: I meant is there anything new in trigonometry. If you were here in 2014, you might see where this is going now. 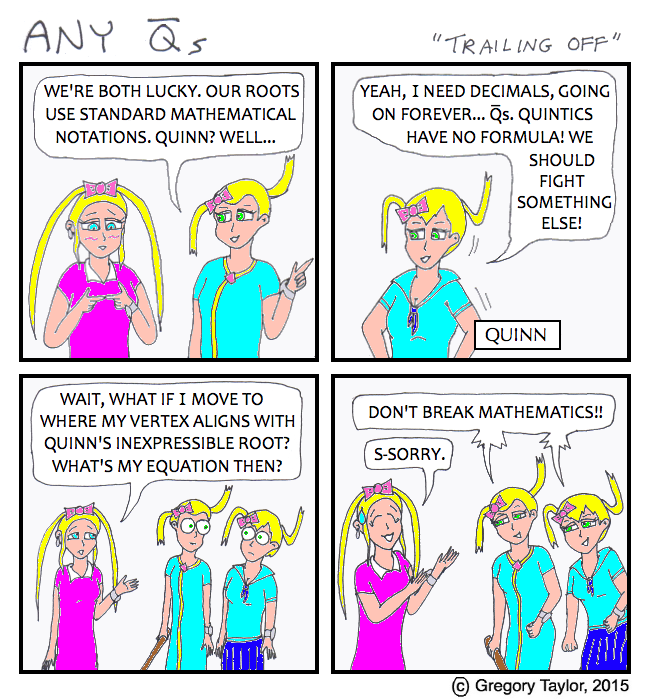 QT: So, there's a math serial outside our panels? QT: Where polynomials like me have animal ears, and trig play in an orchestra? QT: Fine. How does ANY of that relate to me in this silly 'research' outfit?! MAUD: Seven of Nine was popular on Star Trek, and we need numbers like theirs! QT: Star WARS is more popular this week, laser brain. HYPER: Wait! Earlier you said something about decimals? PARA: Oh, well... should we fight a war against decimals? HYPER: Sure! Fractions are better for figuring out our axes. ELLY: Except I don't think it's against decimals? PARA: What? Why? Who would want to hurt math? HYPER: GET OUT OF OUR HOUSE! 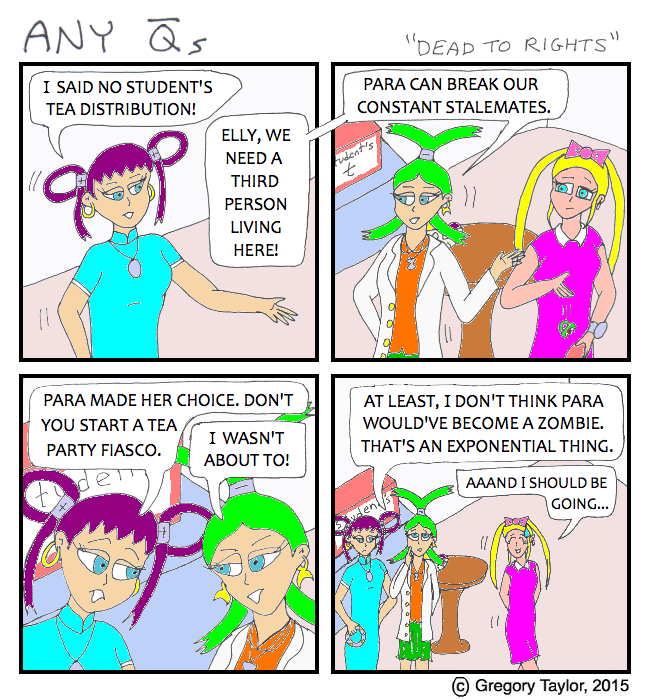 ELLY: I said no student's tea distribution! HYPER: Elly, we need a third person living here! HYPER: Para can break our constant stalemates. ELLY: Para made her choice. Don't you start a tea party fiasco. HYPER: I wasn't about to! HYPER: At least, I don't think Para would've become a zombie. That's an exponential thing. Zeno actually had four paradoxes. 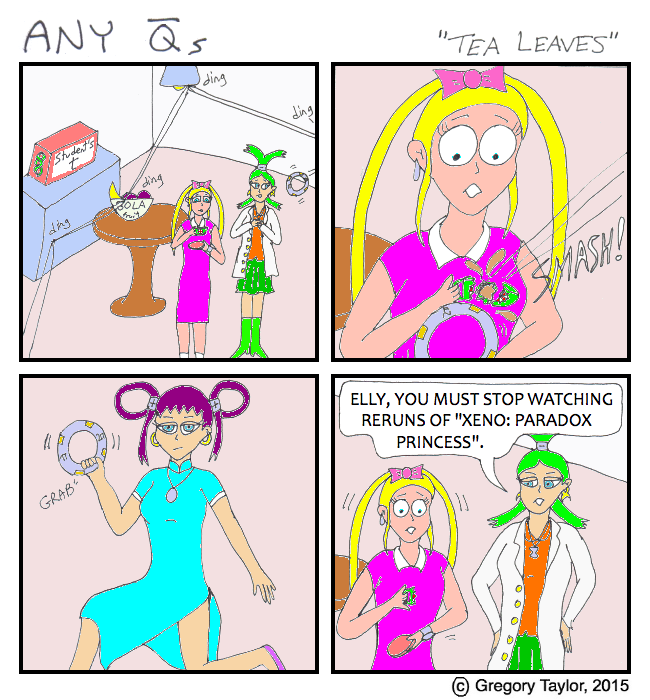 HYPER: Elly, you must stop watching reruns of "Xeno: Paradox Princess". PARA: Is there a tea virus? Are you still trying to make me a permanent resident? Evil! HYPER: Mathematically, you're already under the conic umbrella! Why be suspicious of my tea? HYPER: Para! Come in, we can talk Science, Technology, Engineering and Mathematics! HYPER: First have some tea! I’ve got a box of it here. PARA: Is this a box plot? HYPER: It’s a STEM and tea leaf plot. HYPER: Behold! I have improved my hyperspray design! 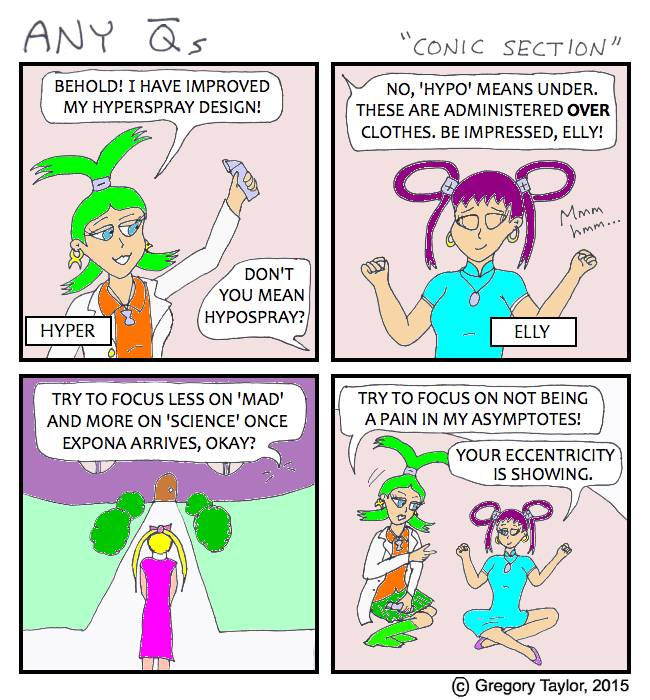 ELLY: Don't you mean hypospray? HYPER: No, 'Hypo' means under. These are administered OVER clothes. Be impressed, Elly! 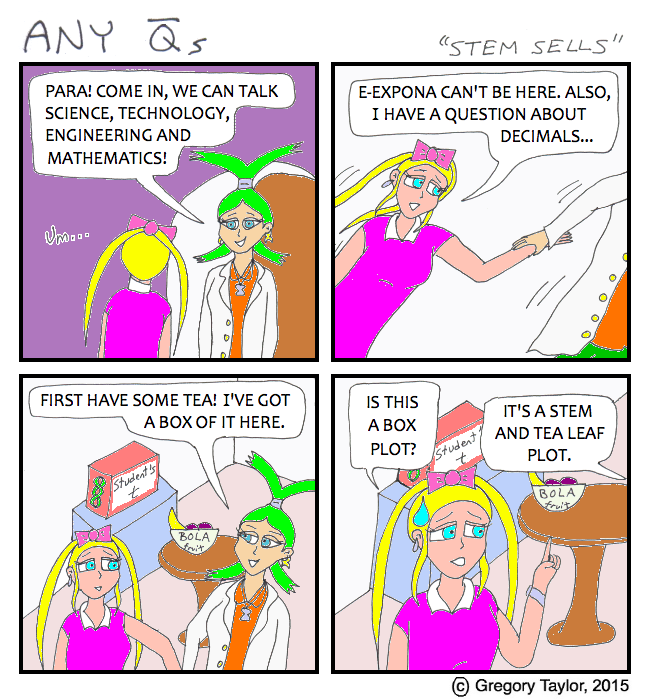 ELLY: Try to focus less on 'mad' and more on 'science' once Expona arrives, okay? 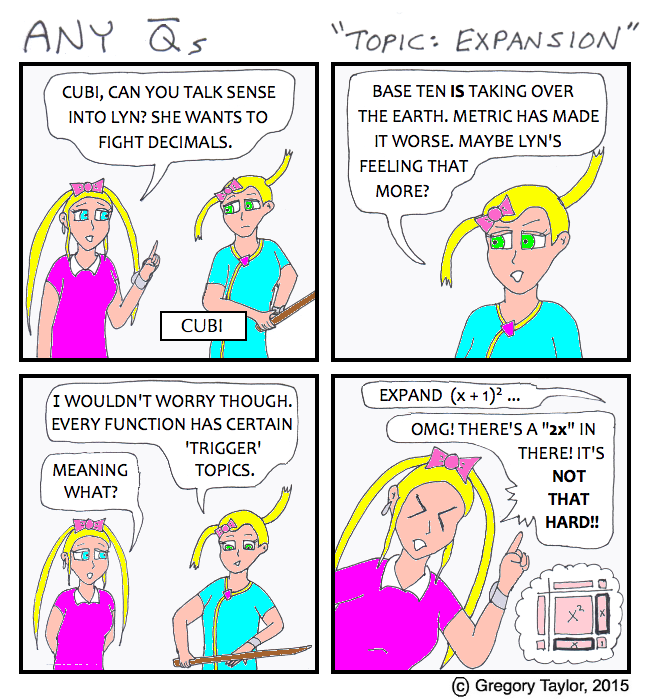 HYPER: Try to focus on not being a pain in my asymptotes! ELLY: Your eccentricity is showing. QUINN: Yeah, I need decimals, going on forever... Q-bars. Quintics have no formula! We should fight something else! PARA: Wait, what if I move to where my vertex aligns with Quinn's inexpressible root? What's my equation then? 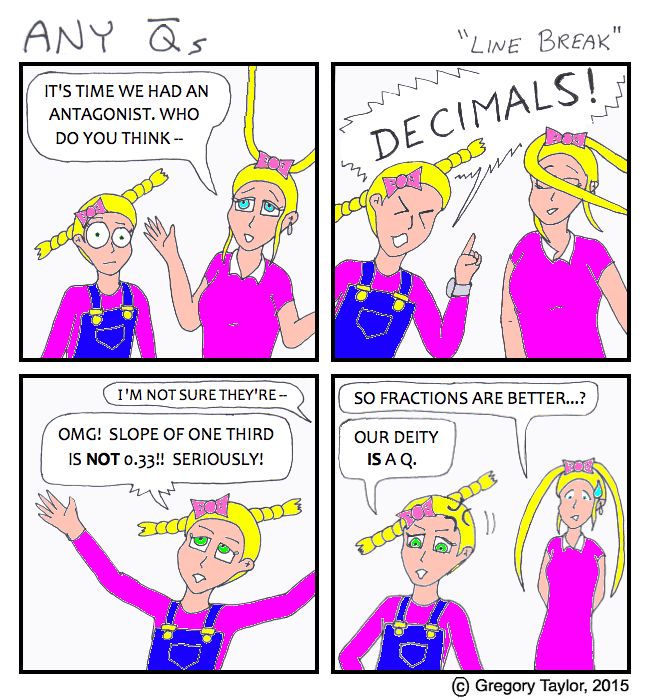 CUBI & QUINN: Don't break mathematics!! PARA: Cubi, can you talk sense into Lyn? 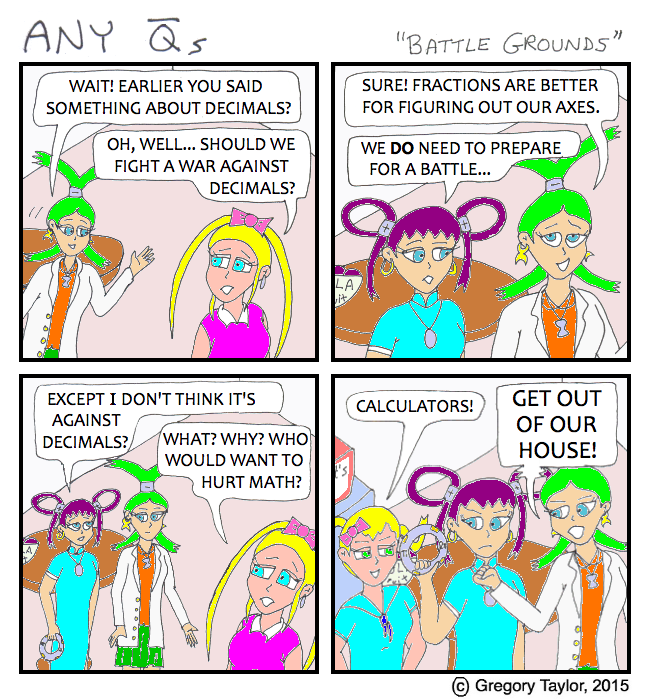 She wants to fight decimals. CUBI: Base Ten IS taking over the Earth. Metric has made it worse. Maybe Lyn’s feeling that more? CUBI: I wouldn’t worry though. Every function has certain 'trigger' topics. PARA: OMG! There's a "2X" in there! It’s NOT THAT HARD!! LYN: OMG! Slope of one third is NOT 0.33!! Seriously! PARA: So fractions are better...? LYN: Our deity IS a Q. "I've Been Working on The Railgun." LYN: I don't trust that Maud guy. PARA: I'll ask Q about him. 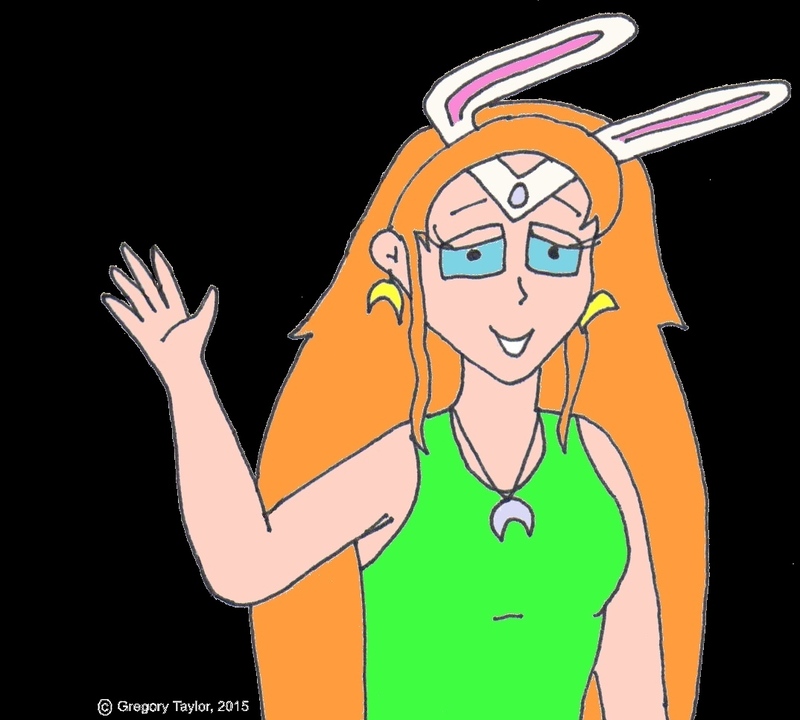 LYN: You talk to Transcendental Pi-Type Beings? PARA: Yeah! But 'TPTB' rarely answer. PARA: I'd need someone like Chordy from that TV show, "Angle". LYN: Those pop culture references need more actual math. PARA: 5 x 5 ? 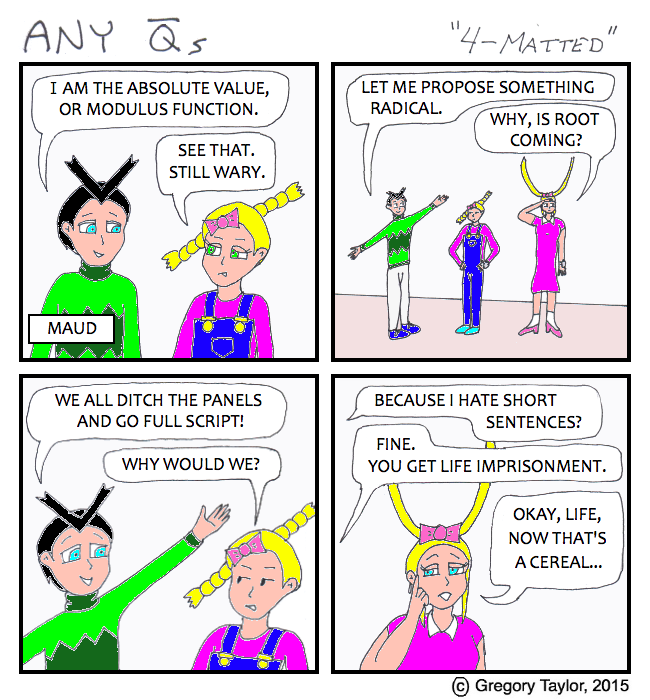 MAUD: I am the absolute value, or modulus function. LYN: See that. Still wary. MAUD: Let me propose something radical. PARA: Why, is Root coming? MAUD: We all ditch the panels and go full script! MAUD: Because I hate short sentences? LYN: Fine. You get life imprisonment. PARA: (hair only) See? Minimizing my depression has confused the artwork. LYN: Who the heck are YOU?? ?? (V-HAIR): I will introduce myself. ?? (V-HAIR): But let’s fix that camera first. PARA: Who wants math CEREAL? If you’ve been monitoring the Facebook page, I’ve been teasing at this return for the past week. But given there’s only 20 likes on that page, and the FB algorithm only goes to, I don’t know, 5% of people unless you pay, this announcement is probably a surprise for many. I will use this post to address what I anticipate to be the common questions. Any I failed to anticipate, you can ask in the comments below. A few reasons. The primary one being inspiration I received from ConBravo, which took place last weekend. It’s a convention of “Everything Geek” in Hamilton, Ontario, Canada. Guests include internet reviewers, webcomic writers, DJs... I plan to make several posts on my personal blog once this launch is complete. I figure, if they’re still at it, why not me too. 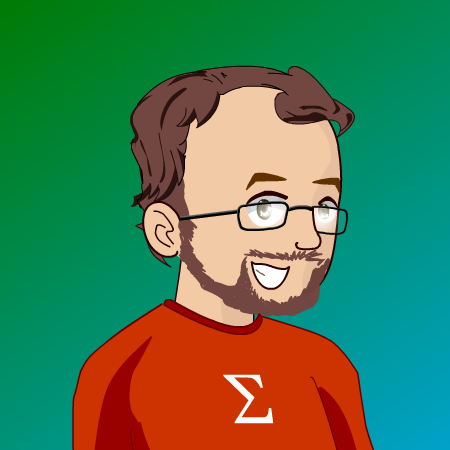 A second reason is “WeSeWriMo”: August is “Web Serial Writing Month”. (Like ‘National Novel Writing Month’ or ‘February Album Writing Month’, but for web serials.) You set your own ambitious goal (loose rule is try for 150% of a normal month’s output) and try to reach it. My goal is basically to launch this, and run it in parallel with my Time Travel Story. The irony is, I don’t feel I qualify for WeSeWriMo. More on that below. Finally, there’s a lot of overhead necessary in doing something like this, from creating templates, to scheduling out a buffer, to trying to create some hype. It makes sense that I do this now, when I have TIME, in August, so that hopefully it’s gained perpetual motion once I’m back in the classroom in September. Related to that, my monthly education column “There Are No Dumb Questions” was pretty much a wrap as of May, so the time I used to spend researching there, has been going here. It also occurred to me that some schools start in August, and I still have this vague idea that educators might like reading mathematical fiction. Meaning I can snare one or two before they’re too busy as well. Maybe. Eternal optimism, I know. 2) WHAT’S WITH THE NEW TITLE? You might notice this isn’t “Taylor’s Polynomials” any more. It’s become “Any Q-bars”, except I have a devil of a time getting the Q to notate with the macron (bar overtop) in most online editors. Hence the alternative title, “Any not-Qs” (~ = not). 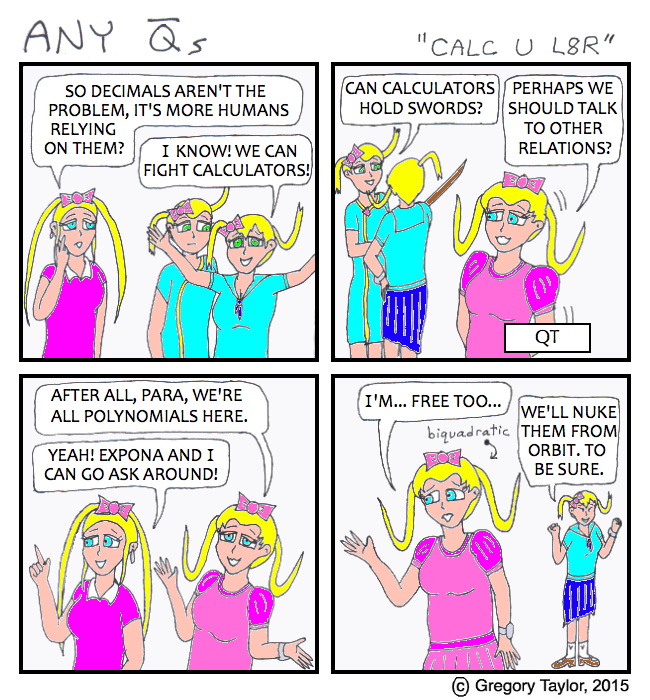 Basically a parody on “Any Qs” or “Any Questions” (the #AnyQs hashtag being used on Twitter, mostly by math educators) and the fact that Q-bar is the notation for irrational numbers. A partial reason for the change is a “reboot” of some of the characters. The person illustrated at the top IS Para. 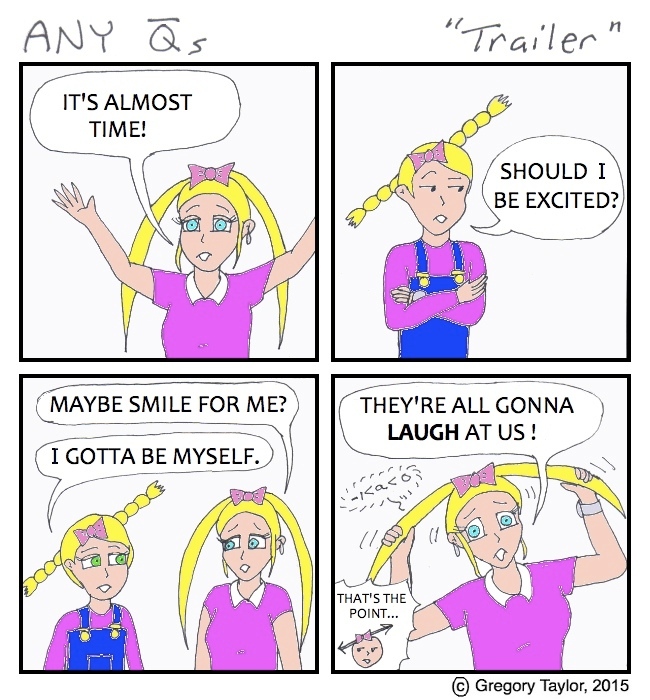 Given my fascination with twin tails, I’m not sure why I didn’t have the idea from the start. (Maybe because it’s a bad idea? I guess we’ll see.) But at “ConBravo” I commissioned some new artwork, based on preliminary sketches, and I think this can work. 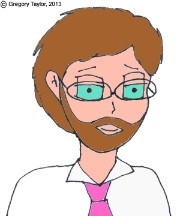 I’d include that commissioned artwork here (as I once did in some prior posts on this very site) except my drawing is of lesser quality. And as my drawing is what you’ll be facing for the next several months, you’ll get to see their work later. To make it a “step up”, rather than my whole series being a “step down” from commissioned work. That said, check out Tabitha Yi, Meg Simmons and Oceantann to see why I selected them. 3) IS THIS A REBOOT? Yes. And no. It’s complicated. It’s a bit like when “Doctor Who” came back. Completely new cast, and a chance to pull in new fans... yet somehow, it will turn out to be in continuity with what came before. In my prior post in March, I said there were “At least two ways I can ‘resume’ (or even ‘reboot’)”, and this is one of those ways. Hence why I’m calling this “Series 7”, even though it won’t immediately look like the same universe. 4) ARE YOU SAYING PARA CAN REGENERATE?? You’ll have to read to find out. 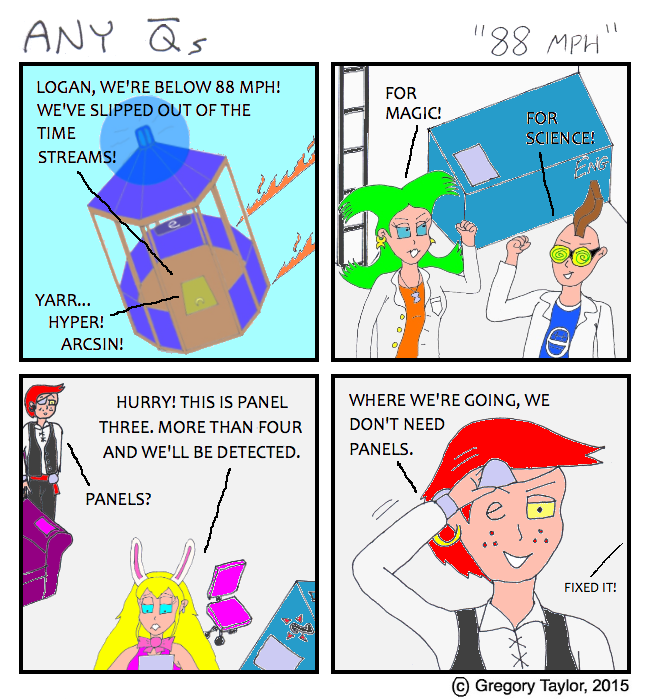 Don’t worry, the reading will be less intense, we’re also shifting into a webcomic format now. 5) WHAT? 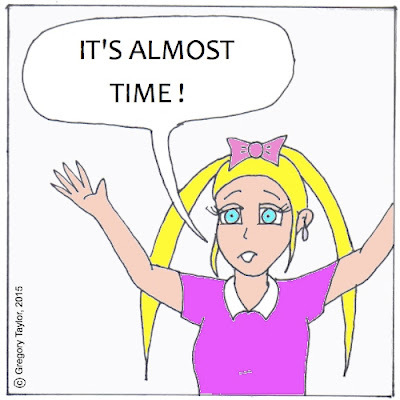 DID YOU SAY WEBCOMIC?! The explanation for the change should be obvious. 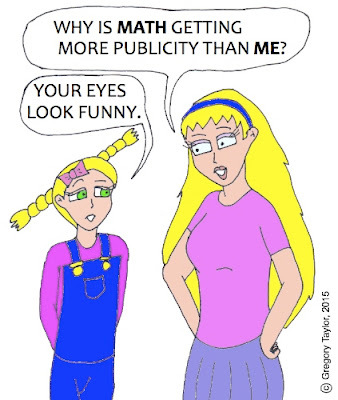 Webcomics are more mainstream. Of course, it’s also massively more complicated on my end. But I have been doing research. I now know how to thumbnail a strip, about the “Crossbar Is” issue in text balloons, and I hope this will become more than an exercise in watching “talking heads”. Don’t expect backgrounds though. Cut me some slack, it’s still an unpaid hobby. That said, if there’s something you’re finding horrible (font choice, ruler inconsistency, perspective problems, other) I’m open to feedback. I don’t want stuff like that to detract from the mathematics. I also don’t have the newest platforms (my phone is 15 years old), so if you see something I need to tweak technologically so that it’s visible on an iPad, let me know about that too. 6) HOW OFTEN WILL YOU PUBLISH? Once per week, on Monday mornings. I figure it’s a good way to start the week, plus while I can bash out 2,000 words per week easily, the drawing component is now going to necessitate at MINIMUM a Sunday afternoon. Because thumbnails (a new step!) to pencil to ink to scanning to formatting (new step!) to text balloons (new step!) to colouring to transferring to my new computer (which has no drivers for my old scanner). Whew. At any rate, I may consider the occasional “special strip”, for noteworthy events or holidays, kind of like my “specials” in the “Taylor’s Polynomials” days. 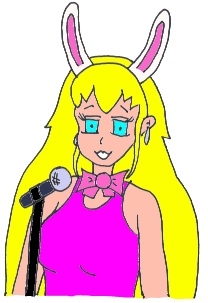 To that end, song parodies are liable to continue, because I’m known for it locally. Beyond this, we’ll see. 7) WHY SHOULD I BE INTERESTED? Because you like math? Because you like comics? Because you’re a writer looking for inspiration? Because you’re an educator who doesn’t think every blog has to make you think about teaching? Because you think it might be informative to watch someone implode from stretching themselves too thin? Look, when it comes to mathematics, I know most readers prefer non-fiction. So if this is the last I see of you until my next “useful” post, so be it. But can I ask one thing? Please? Even if this isn’t in your wheelhouse, tell someone else about it. A colleague, a student, a role-play friend, hell, even an enemy, I’m not gonna be fussy. Yes, I’m a niche market. But since 2011, this has been my “brand”, to use Sam Shah’s TMC15 terminology. Or to quote Christopher Danielson, it’s what I love, I’m doing more of it. So maybe, just MAYBE, there’s someone else out there who’s interested too. Eternal optimism. Ergo, if you’re not interested... RT for a friend, maybe? I do read every comment. 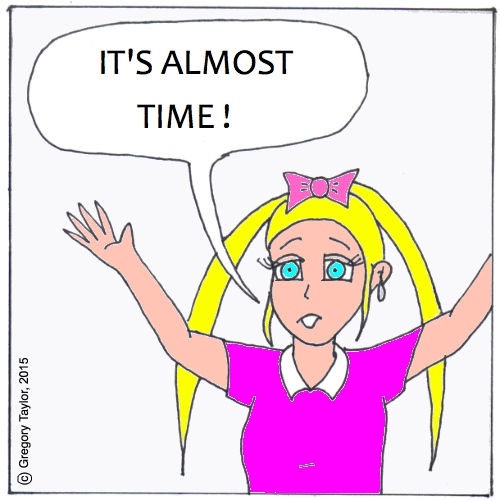 Quick shout-out here to those who have posted something - here or on Facebook - about the 200+ entries already out there: Scott Delahunt, Audrey McLaren, Christopher Burke, Jennifer Silverman, Education Realist, David Wees, Fernando Martinez, Carl Joshua Quines, Sue Van Hattum, RedBean, Elizabeth H, Not-a-furry and Slim Shady. Thanks for reading. Here we go again. The Soundtrack for this post is here. And it’s a sad picture. Somebody else gets what you wanted again. And you know it’s all the same. ...But these things will change. Taylor's Polynomials. 222 episodes about mathematics. Not even three quarters of a revolution (unless you’re in radians). Last May, it drew me to one final conclusion: There is no interest in a mathematics blog when it’s underlying story is fiction. I now think I had that wrong for two reasons. And while I say “lying” (because that number is cumulative over many weeks), the Facebook page HAS gained a couple likes. Then the math story came up unexpectedly on the Web Fiction Guide Forums, where I’ve been spending more time lately. There’s also evidence to suggest (from hit counts) that at least one person has done an archive crawl here within the last month. Moreover, someone on Twitter mentioned the characters completely unprompted the other day. And honestly, I can’t completely pull away myself - I’ve spent the past 22 weeks posting reruns of the first story up onto wattpad. There was something to this. There IS something to this. After all, “Inside Out” (coming in June 2015) is getting huge press, and Disney’s Pixar is merely personifying emotions. That’s not half as interesting as mathematics. Now, don’t charge to the calendars. I’m not about to give a resumption date. First, there’s at least two ways I can “resume” (or even “reboot”), and I’m not sure which way I’d want to do it. Second, I don’t know for sure that I want to yet - it’s still possible that my time would be better served doing something else. Third, I do have some other things on the go. There’s a time travel story on the shelf. And another serial, currently running. About that: in September, I started up a new blog, designing a multiverse for all my old characters to play around in, doing it in a “Choose Your Own Adventure” style. The readership results have been abysmal as compared to here - whereas I used to manage 40 views per post on “Taylor’s Polynomials”, I’m lucky to get a quarter of that over there. Which is: (1) Expected, and yet (2) Informative. I’d say it takes MINIMUM a year to build an audience, probably more, and I’ve only been writing The Epsilon Project for a little over six months. At the same time, I’ve been advertising it in all the same places I advertised THIS story (Twitter, Facebook, Tuesday Serial, Forums)... so the fact that it’s doing so much worse is confirmation that it’s my marketing which is the most horrible thing ever. As opposed to, say, my writing. But I’m not the type to drop something halfway. (It still bugs me that I haven’t written the conclusion to “Marmalade Mercury” from over 10 years ago. Scott, you’re the only one who will get that reference.) So, the new serial story will retain my attention for a while yet. Meaning writing here would involve running two serials in tandem. Granted, an idea which has it’s own appeal, but at the same time, I’m not quite that crazy. Yet. So... if nothing’s changing, why bother to post here at all? Well, I wanted to see who was still out there. (Feel free to comment below.) And “Pi Day” (3/14/15) seemed like a good day for that. Also, there’s the following. Song parodies have continued. In a very minimal sense, granted (I have this teaching thing going too! ), but there ARE 3 more that are worth getting out there. I’ll be posting them sporadically over the next few weeks. I can’t say for sure when (I want to do some accompanying graphics), but I’ll do the usual of updating the Facebook page and advertising on Twitter. Meaning you probably won’t see them in the social media storm, so I suppose check back infrequently? Tune of “I’m Getting Over You” by Carley Ray Jepsen. Officially making her the first artist I’ve parodied twice for math. I actually wrote this in Sept 2013. I didn’t like it. It’s aged remarkably well. Tune of “I Love It” by Icona Pop (feat. Charli XCX). Written in July 2014. Because I felt like “Fractal City” needed an anthem of sorts, and this song was pretty big - uh, over a year before. Tune of “Can’t Choose” by JRDN. Written in Sept 2014. Because my Data Management class needed a song for this unit, damn it. I think that’s everything for now. Thanks for reading! Reward yourself with some pie. PARODY #29: "MCF 3M Course"
Tune of “Pop Music 101” by Marianas Trench. Written in June 2015. Because the course needed a wrap-up and students were inspiring me.